The Grade 1 Delaware Handicap has managed to attract its share of top fillies and mares in recent years, with champions Royal Delta, Blind Luck, and Havre de Grace taking part in the past three runnings, and the quality racemare Life at Ten winning the race in 2010. The problem hasn't been attracting star talent to run in this race. The problem has been getting additional runners to show up to challenge the heavy favorite. Royal Delta won the last two runnings of this race on her way to champion older female honors, and did so at odds of 2/5 in 2012 and 1/2 last year. The 2011 running, while stacking up as a virtual match race between Blind Luck and Havre de Grace, was as thrilling as a horse race can be, but found Blind Luck prevailing by the shortest of noses at even-money. The 2010 edition went to another odds-on favorite, the aforementioned Life at Ten, who paid $3.20 to win. In keeping with the trend, this year's running of the race features the Todd Pletcher-trained Princess of Sylmar, who is pegged at even-money on the ML and figures to settle somewhere south of that number come post time. Princess of Sylmar exits a stellar running of the Grade 1 Ogden Phipps on the Belmont Stakes Day undercard, where she squared off against two of the other (or, if you prefer, THE two other) leading older fillies in the country, Close Hatches and Beholder. After settling last in the field that day, Princess of Sylmar swung into action on the outside coming to the stretch and was grinding on gamely all the way to the finish, ultimately falling a head shy of catching Close Hatches at the wire. Today, she faces no opponent as talented as Close Hatches (or Beholder, for that matter) and is going to be very hard to beat. Not that you needed us to tell you that. If you are looking for an alternative to the heavy favorite, or a horse to use with her in the exotics, we would point to the winner of the local prep for this race, Gamay Noir, who prevailed in the nine-furlong Obeah, overcoming a wide trip from behind a slow pace to do so. 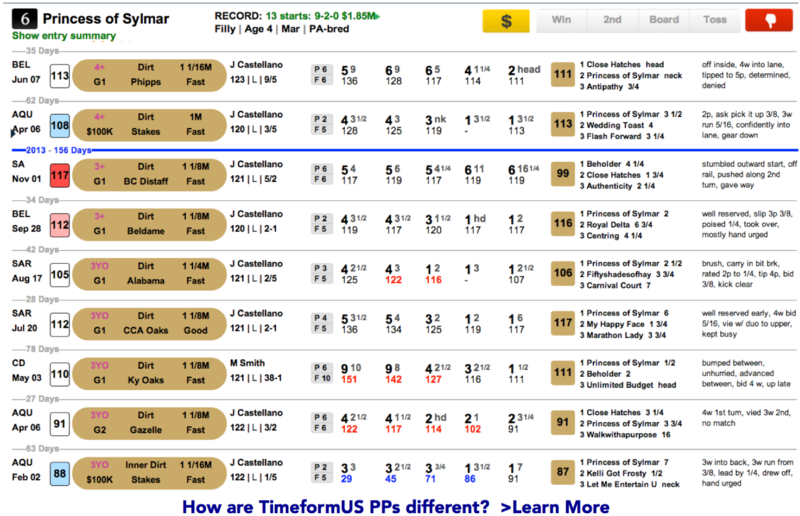 She earned a new top TimeformUS Speed Figure of 105 for that effort, and while that kind of figure will not put a scare into Princess of Sylmar on her best day, she gets some extra credit from us for overcoming a tough trip and pace scenario. While there isn't that much pace signed on here to help her late run, the 1 1/4-mile distance may suit her staying ability, and that could easily make up the difference. The two runners exiting Churchill's Fluer de Lis Handicap, Molly Morgan and Flashy American, are also logical contenders. Molly Morgan earned a strong 110 TimeformUS Speed Figure for her winning effort there, and she put in a solid run up the rail to seize control of that race through the second turn. She was much the best that day, and that 110 matches her lifetime top, which is a positive sign for her. Flashy American wasn't able to threaten in there after a wide trip, settling for a no-threat second. While she didn't have the run of the race that day, she has seemed to be running a couple of levels below her good form of last season, and we would prefer to stick with Molly Morgan out of that Fleur de Lis. 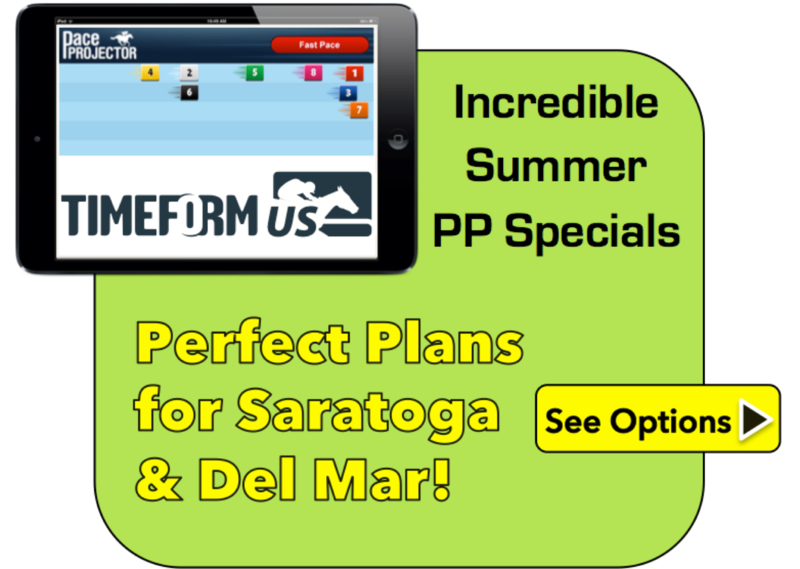 We are not interested in playing against Princess of Sylmar in this spot on Saturday, and would key her in the multi-race exotics while playing a straight Princess of Sylmar/Gamay Noir exacta within the race. The Grade 2 Bowling Green, run over 1 1/2 miles on the Widener course, drew a well-matched field of seven, which is likely to scratch down to six with Chamois (#4, 8-1) cross-entered to an easier spot over the same distance at Delaware Park on Saturday. This race appears to go directly through the 6/5 ML favorite, Grandeur (#5), who recently finished 4th in the Grade 1 Manhattan and 3rd in the Grade 1 Man O' War and takes a bit of a step back in class here. He ran TimeformUS Speed Figures of 113 and 112 in those two races, and while those figures make him competitive in here, they actually give him no edge at all over several of these horses. He has better races than that to get to, but he'll likely have to in order to come out on top in this race, and we thought that he was just picking up pieces at the end of the Manhattan last time while finishing a no-factor 4th. We have no argument with him as the horse to beat, but we think we can do better than taking him at a short price. Instead, we will be looking to beat Grandeur in this spot. The second choice on the ML is Boisterous (#3, 3-1). Boisterous is, like Grandeur, a logical horse in this race, and he is going to be very tough if he shows up here with his best stuff. The problem with him is that he hasn't appeared to have his best stuff yet since being privately purchased and sent to Todd Pletcher's barn for his last four starts, and he has always been a horse who is at his best with a little "give" in the ground. We also have never thought that he was at his best at this kind of distance. Unless it rains, in which case we would move him up, we will stand against Boisterous on top. We want to try Hangover Kid (#1, 5-1) on top in this race. He figures to be a playable price in here and is not a horse who gives you concerns over distance, as he has run very well over 1 3/8 miles several times in the past and done so in some tough spots. He has also managed to run TimeformUS Speed Figures on par with the two most recent figures earned by Grandeur, and he bounced back from a no-show effort at Keeneland with a strong runner-up effort at Monmouth last month. We think Hangover Kid is dangerous in the Bowling Green at a square price, and we like that he reunites with the hot-riding Jose Lezcano for this. He will be the focus of our play. The other horse for us is Reflecting (#7, 8-1), who actually turns back out of a 2-mile race, one in which he was an unlucky loser at a big price after failing to gain clearance at a crucial point in the stretch. He is a typical slow-developing runner from the Phipps/Shug McGaughey operation, and he is also the field's lone two-time winner over 1 1/2 miles. 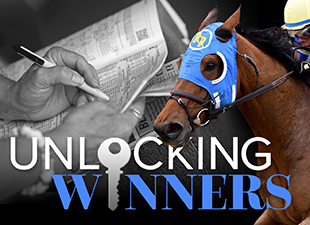 Saver exactas: Grandeur over Hangover Kid & Reflecting.